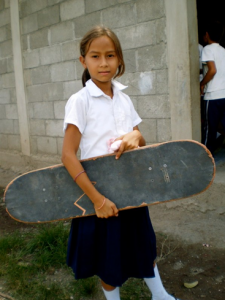 Just had a great e-mail from Chantelle who has started the Bridge To Skate organization which is a public charity that uses skateboarding and play to aid in the creation of life skills, promotion of health, fostering of peace and education of cultural differences internationally! They just built a small skateboard park in a mountain village in Honduras, and are working to fundraise to build another, along with a playground and school. In Honduras, the only option for activities in the mountain villages is really soccer, so to be able to provide another option, mostly for the kids that aren’t good at soccer, is incredible. All of the children have fallen in love with skateboarding, and any skateboarder can understand what a skateboard can offer a child. If you check out the website you can see all of the other programs Chantelle has started including the ‘learn to skate’ clinics where girls are definitely a top priority!